Twelve volt DC power supply features a dual jack input enabling you to receive satellite signals and off-air TV. 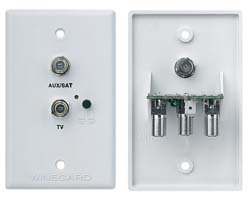 Features a built-in two set splitter and a flush mount wall plate. 1 per card.